An apartment situated on the third floor of a building with a lift in the world famous Paris street in Prague. 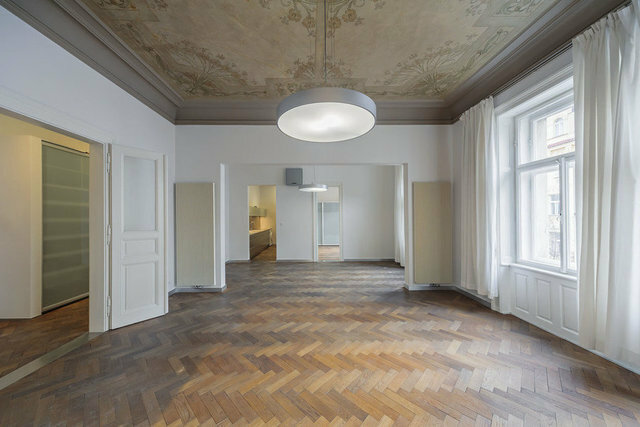 The apartment has gone through a complete reconstruction in 2005 according to the design by studio Donlić and its architect Ivana Dombková. The new design created a beautiful harmony between modern layout with modern furnishings and original classical decorative features. The apartment has two bedrooms, two bathrooms, a kitchen and a large living space with a dining and sitting area. Part of the design are also several built in wardrobes. There are two balconies, one to the inner block and one to the Paris street from which you can enjoy a beautiful view with your morning coffee.